Fiction – paperback; Faber and Faber; 245 pages; 1999. Just as Rupert Murdoch’s print media empire was going into freefall — the phone-hacking revelations, the News of the World closure, the BSkyB takeover bid being scuppered, the arrests of past editors, the public enquiries into News International’s behaviour, resignations of two top MET Police officers (need I go on?) 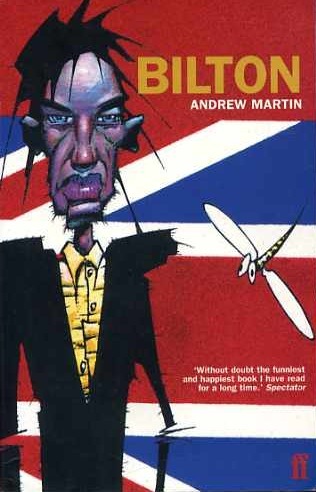 — I was mid-way through Andrew Martin’s Bilton, a novel about journalism. In some ways the novel suffered by its comparison to events unfolding in London’s “Fleet Street” — and seemed, somehow, the poorer for it, probably because it just seemed so damn tame. And yet this is a book that is often laugh-out-loud funny — preposterously so, I might add. At the time of publication, in 1999, it must have seemed a little inventive, because surely star-hungry politicians would never manipulate the media in such an uncouth, underhand manner and journalists would never turn themselves into news stories, would they? Because that’s what happens to Bilton, a miserable but successful “comment and analysis” journalist, who accidentally throws a cup of coffee in the face of the prime minister and becomes headline news. The prime minister, Lazenby, is well into his second term and is “veering from ambivalent support to definite hostility”. His new policy of Social Dynamics — which is alarmingly similar to present prime minister David Cameron’s Big Society idea — has been exposed as a sham; it pretends to be egalitarian but is actually about making money for a select few. The incident couldn’t happen at a better time for Bilton, who is sick of his job and feels like he’s been passed over for promotion once too often. Overnight he becomes a hero and is transformed into a media sensation. The story is told through the eyes of lifestyle journalist Adrian Day, who befriends Bilton before the incident occurs and is present when it happens. He knows the truth — that Bilton was incredibly drunk and “threw” the coffee when he slipped on the floor. It was not a “political act” planned in advance, which is the way that Bilton and the media spin it. As Bilton’s stardom increases, he begins to lose his integrity. Somewhere along the line you know that the truth will out, and it isn’t going to be pleasant — for anyone. The novel is billed as the funniest fiction about journalism since Evelyn Waugh’s Scoop, and I agree that there are some very funny moments in it. It also shares Waugh’s sense of the ridiculous, when a war breaks out between Britain and Russia that no one quite knows how to cover properly. Indeed, our narrator is called into the office on the day that Russia attempts to fire the first of three nuclear weapons at the heart of London, and is told by his boss that he wants him to edit a new Sunday supplement. The book pokes fun at the relationship between the press and politicians, and shows how one feeds the other in a weird interdependent but cannibalistic fashion. It cuts very close to the bone. And dare I suggest the following: it should be required reading for anyone naive enough to think that the current News International scandal is the first time that the media and Downing Street have formed “inappropriate” relationships with each other. Sadly, Bilton appears to be out of print, but you can pick up very cheap second-hand copies from Amazon marketplace and elsewhere. I’ve had a copy of this in the TBR for ages – seems like a novel I’ll enjoy, so I’ll hold on to it! I must, must read Scoop at some point Kim. I have to say whilst this book sounds like its a good laugh, and indeed about journalism which interests me, that cover freaks me out! The cover is pretty horrible, isnt it?? Definitely not one that makes you want to pick the book up. But the contents do make up for it!